The Coconut is not a nut…. 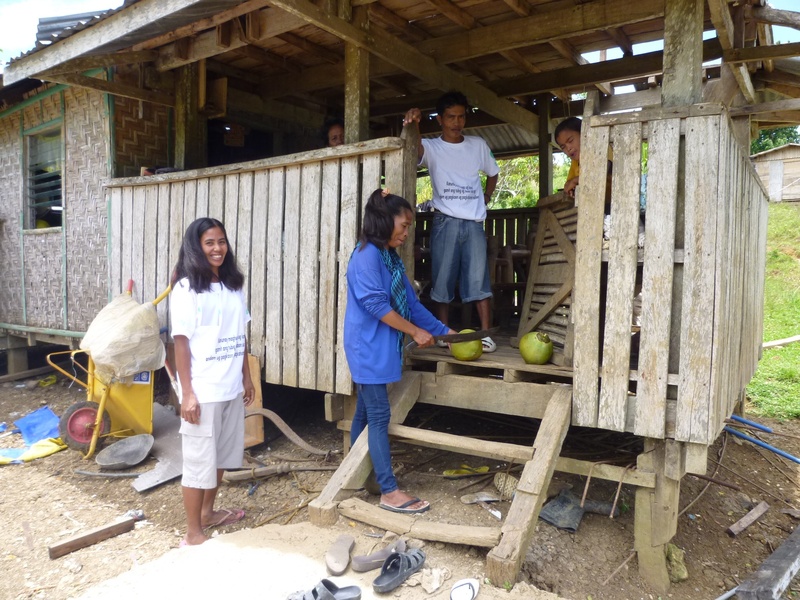 So, moving on to part 2 of this post about how to rebuild livelihoods after typhoon Yolanda. This time – the Coconut challenge! The coconut tree is a truly fascinating plant. Did you know that the Philippines is the largest producer of copra (coconut flesh used to extract coconut oil) in the world? Or that the coconut tree is incredibly versatile. It can produce copra, which in turn can be turned into coconut oil, and the leftovers converted into high-protein animal feed. The oil itself can be converted into edible cooking oil or coco biodiesel used in the cosmetics industry, or converted into diesel fuel. The coconut shell can be turned into charcoal and used as fuel, while the fibres from the outside of the shell, or coir, can be used as material for upholstery padding, floor mats, mattresses and handicrafts, and as a soil erosion control tool. Coconut shells make lovely handicrafts and holiday souvenirs too! The coconut water can be used as a drink, as well as to make vinegar, wines and coco sap brown sugar. And of course there’s always the lumber you can get from the tree trunk after it stops producing fruit. So, all of these fascinating facts bring me onto the massive challenge faced by NGOs in the Philippines in the aftermath of typhoon Yolanda. 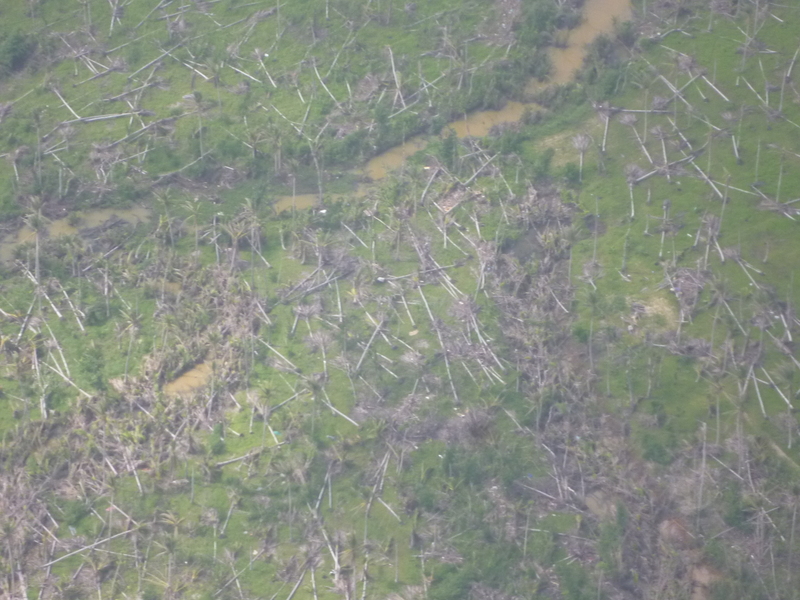 33 million coconut trees were damaged or destroyed during the storm, which equates to a MASSIVE portion of the Philippines copra export market. Furthermore, it takes between 7 and 10 years (depending on the variety) to grow a new coconut tree from a seedling to fruiting maturity. And the Philippines does not have 33 million coconut seedlings kicking about. So you can imagine what effect that will have on the Philippines GDP over the coming years. And more to the point, what will all those coconut farmers do to make a living in the meantime? As with fisheries, you are looking at a much wider group of people than just the farmers – there are the landowners, tenants, and casual labourers who are out of an income, not to mention all the supporting businesses that will suffer – the companies that truck copra to the processing plants, the people who strip the flesh from the shells, and people who produce animal feed, coir, charcoal, and fertilisers from coconut. All pretty much going out of business for the next 7-10 years. This issue requires a massive and very much long-term strategy, which goes way beyond an emergency response. At the moment, the most obvious viable option is inter-cropping (growing other crops on the ground in between the trees). There is a need to encourage crop diversification (multi-cropping) and move farmers away from mono-cropping, which will provide them with higher chances of maintaining a livelihood through different natural disasters. By having several different types of crops, you can help the farmers through the next typhoon, flood or pest infestation, as some crops may survive while others won’t. There are plenty of options for inter-cropping. such as root crops like cassava and camote (sweet potato), bananas, abaca fibres, bamboo, vegetables, coffee, cacao, black pepper and pineapples. However, the challenges to inter-cropping are quite varied. First of all, you need to do soil testing and analysis in different areas to know what the pH content of the soil is, to determine which crops are likely to grow well in that area. You also need to factor in things like slope inclines and flooding risks, as some crops won’t grow as well on a hillside as others. Then there’s the issue of immediate food security needs, and plant maturity rates. Any farmer will tell you that you can’t just grow a cash crop overnight. It might be faster than coconuts, but all these crops take different lengths of time to mature, and some can only be planted at certain times of the year. For example, bananas take around 8 months to grow from seedling to fruiting maturity, while some vegetables and root crops need around 2-3 months. Bamboo can take anything from 1 to 5 years, depending on the variety. So how are those farmers supposed to feed their families while waiting for their crops to grow? Vegetables are the fastest-growing of the options, but you need to make sure you don’t flood the market. If you hand out vegetable seeds to everyone, they’ll all have lots of lovely veg to eat, but no-one is going to buy it in the market if everyone has it in their gardens at home. So there is a need to carefully analyse the supply and demand of different crops, and look at the value chain for the commodity in question. Equally, if you introduce a new crop, such as coffee or cacao, that people in that area have never grown before, you need to look at the market chain to see whether or not those farmers will be able to sell their produce nearby. If they can only sell it in Manila, or the nearest town with a coffee processing plant, they may not be able to afford the transportation to get it there, leaving them with a whole lot of coffee beans they can’t sell locally. And of course you also need to provide an awful lot of training for farmers on how to successfully grow a different crop. I certainly wouldn’t know the first thing about growing coffee, and a farmer who has only ever grown coconuts is not likely to know much more about it. There is also a need to consider the tenant-landlord relationship. 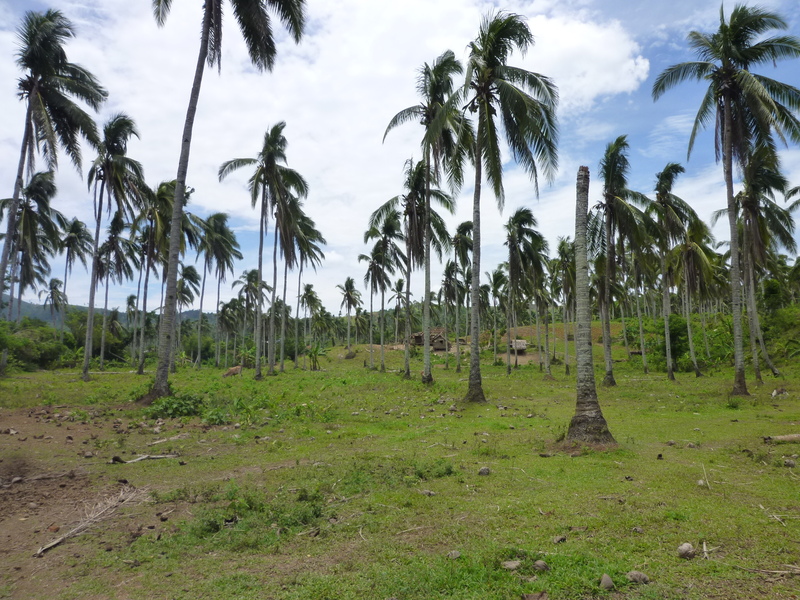 In most areas, there are landowners who own anything from 1 to 100 hectares of coconut land, and they often have tenants who work the farms. These tenants may need permission from the landowners in order to grow new/different crops on that land, and it’s not always a given that the landowner will agree to that. Livestock is also an option, although in rural areas this tends to be household based for additional income rather than a large-scale income generating activity in it’s own right. Most people raise 2 or 3 pigs a year, which they will sell every 6 months or so (or just before a major festival or holiday) to supplement their income or see them through the leaner months. And distributing livestock comes with it’s own set of challenges, such as vaccinations, and training in proper animal care etc. But many farmers who are struggling for an income are unlikely to be saving their seedlings to replant, as they can get more money selling the young coconuts to big companies for coconut water and other products. And let’s face it, money to feed your family now is a much more urgent need than planting something now that will feed your family in 10 years…. In a brief segway into climate change and rice farming, there are some interesting innovations going on over here. The Philippines is a country where they have regular natural disasters like typhoons, flooding and earthquakes year after year, which are only increasing in frequency and intensity. How do you help rice farmers cope with the changing climate and adapt in order to continue making a viable living? Did you know that a 1°c rise in temperature results in a 10% decrease in rice yield? So as global temperatures rise, how will people feed themselves, and meet the global demand for rice? One fascinating project that is going on in Mindanao at the moment is Climate-Resilient Field Schools (an adaptation of a traditional Farm Field School model). In this, you have several aspects in order to help farmers maximise on their yields and livelihoods. Firstly, you set up a weather monitoring station at the local government office (or nearest town) and provide training to the local Department of Agriculture in how to monitor weather patterns, make 10-day weather forecasts for their district, and set up early warning systems for extreme weather conditions. Having this information made available in rural farming areas will help inform decisions about planting and harvesting, to avoid massive crop losses in storms and floods, or unusually hot weather. Secondly, you set up a field school with local farmers that covers and entire cropping season from seed planting to harvesting (usually around 6 months). The farmers will come to weekly training sessions on things like making their own organic fertiliser, and how to plant to maximise crop yields. They set up a testing area where farmers can experiment with different farming methods and technologies and fertilisers, and try out different seed varieties to see what will grow best in that area. The farmers learn skills through practical field farming, and training sessions, which can help improve their yields, and allows them to share their knowledge with other farmers. This entry was posted in 2014, Philippines and tagged 2014, Haiyan, Philippines, Super-Typhoon Yolanda by worldenoughandtimeblog. Bookmark the permalink.